Parker, CO, August 12, 2003The ever popular Dressage in the Rockies I and II once again drew riders from several states to the Colorado Horse Park at High Prairie Farms. Amateurs, juniors and top professionals competed in the three-day, five-ring show that also featured the USDF Cosequin Sport Horse Breed Show. Mazarin, ridden by Joan Bolton, was the big winner in the open FEI classes. The elite Hanoverian stallion owned by Paradigm Sport Horse Farm in New Mexico claimed the FEI High Point Award for both shows with scores up to 68.250 in Prix St. Georges. 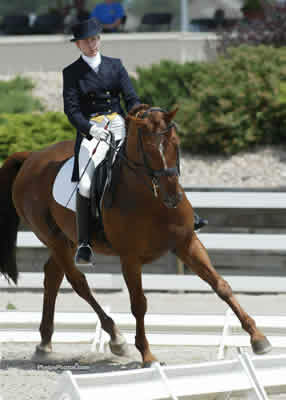 Mazarin and Joan Bolton were the FEI High Point Champions for both shows at Dressage in the Rockies. The high point awards were sponsored by Markel Insurance. The Reserve Champion FEI High Points for each show went to Sue Halasz riding two different horses. Inca, a Dutch gelding, owned by Barbara McElnea was the reserve champion for show one. The pair won the I-1 Freestyle with a brand new routine designed by McElnea just two weeks prior to the show. Halaszs other FEI Reserve High Point was won on Lector, a Dutch gelding owned by Janice Jaspers. He is a very excitable horse with a very, very good work ethic, Halasz said of the son of Pion. Plans for the ten-year-old gray include qualification for next years USET Festival of Champions in Gladstone, New Jersey. Halasz was also High Point Upper Level Champion at the first show with Crooked Willow Farms Romeo, a horse that is currently for sale. Halasz said, If he doesnt sell well be happy to keep him. He will be a super FEI horse. He really has a talent for piaffe and passage and he loves to work! The duo scored a 72% in third level test three. Sue Halasz and Janice Jaspers' Lector were FEI Reseve High Point Champions at the second show at Dressage in the Rockies. Two other Crooked Willow owned horses also were big winners for Halasz. Chaleon, a five-year-old stallion by Calido I was victorious in two of his three first level classes. Our plan for him is the FEI Young Horse classes next year, explained Halasz. Orleandro by Oglio was also a winner at first level. Halaszs assistant trainer Kristen Aggers also had her share of tri-color ribbons with Deborah Carters Dutch gelding La Vie Nouveaux. The pair claimed the Upper Level High Point Championship at show two and the Reserve Championship at show one. Hes a really special horse, Aggers said. Young rider Tyler Haney and her beautiful gray Phoenix were Upper Level Junior High Point Champions at the first show and Reserve FEI Junior High Point at the second show. 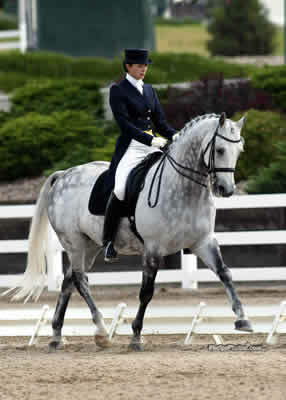 Kristen Aggers riding Deborah Carter's La Vie Nouveaux claimed Champion and Reserve Champion Upper Level Horse at the Dressage in the Rockies shows. 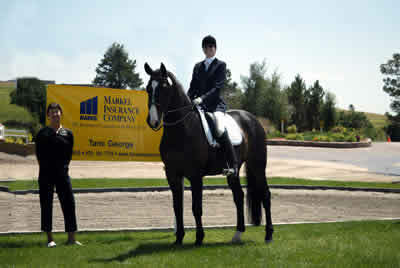 Tami George represents Markel Insurance, sponsors of the High Point Awards at Dressage in the Rockies. Markel Insurance once again sponsored the high point awards. The USDF Cosequin Sport Horse Breed Show demonstrated the continued increase in quality in American sport horse breeding. Filly Champion Tambre, bred at DG Bar Ranch in California, is by Dutch World Championship team member Jazz, an approved stallion by Cocktail.